Architect Domenico Fontana (1543 –1607) was born near Lugano; in 1592 he moved to Naples and lived out his life there. Before coming to Naples, Fontana was active in Rome under the patronage of Cardinal Montalto, who became Pope Sixtus V. In Rome, Fontana built the Cappella del Presepio (Chapel of the Manger) in the basilica of Santa Maria Maggiore; near that basilica he also built the Palazzo Montalto. He was also responsible for alterations in the basilica of San Giovanni in Laterano and for some work within St. Peter’s, including the raising of the mammoth 327 ton obelisk in the square. Fontana was invited by the Spanish viceroy (under Philip II of Spain) Juan de Zúñiga y Requesens, to Naples where he held the title of Ingegnere Maggiore del Regno di Napoli (chief engineer for the Kingdom of Naples) until his death. In Naples, Domenico founded a new firm with his son, Giulio Cesare Fontana (1593–1627), and the architectural engineer Bartolomeo Picchiatti. Domenico Fontana was mainly active in urban expansion in the Naples of the day. 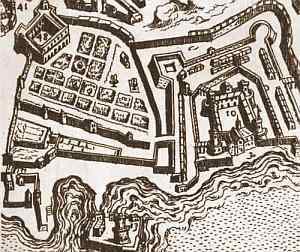 Examples include the expansion of the area adjacent to the Maschio Angioino (the large fortress at the port) an area that had already received much attention in terms of fortifications some decades earlier under viceroy Toledo. The area is now Piazza Municipio and is again in the midst of its umpteenth episode of rebuilding as work for the new subway line progresses. A later map (right) is the Stopendaehl map (by Dutch engraver Bastiaen Stopendael —also spelled ‘Stoopendaehl’ in some sources) from 1653. (The map measures 42 x 102 cm—17 x 40 inches— is engraved in copper and is in the holdings of the San Martino museum in Naples). The map shows Fontana’s creation on the upper right, extending from where the old vice-royal residence had been down to the area above the shipyards, the old “arsenale”. 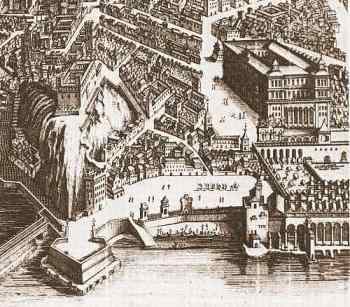 The area in front of the palace had not yet been expanded into what one today knows as Piazza del Plebiscito. Nor had the Santa Lucia area undergone the dramatic expansion of the late 1800s, the so-called Risanamento. One sees the old Santa Lucia harbor and beach adjacent to the arsenale and, above it, the open area and adjacent streets below the height of Pizzofalcone (Monte Echia). The streets of Santa Lucia, though greatly modified by the Risanamento, were originally the work of Domenico Fontana. Work on the Palace was begun in 1600. Fontana did not live to see the completion, which was carried out by his son. The Palace, itself, was greatly modified in the mid-1700s by the great architect of that period, Luigi Vanvitelli. There is a street in Naples named for Domenico Fontana; it is way up on the “high Vomero,” the hill above Naples. In 1600 there was nothing up there but woods and spooky goings-on (the secret workshop of scientist/sorcerer Giambattista della Porta, for example). It is doubtful that Domenico Fontana could ever have imagined me being stuck in a traffic jam on a street named for him.